I am a big advocate for defining direction and strategy in business. We need to be pro-active to set the business compass, and program the GPS. But…sometimes it has to go in reverse. The business (customers and the marketplace and circumstances) may just override all your intentions and define your direction and strategy for you. Or, at least, refine it. This calls for opportunistic flexibility. I figure we can get our strategic direction about 85% right – at most. That’s enough to move forward with. But nobody has perfect foresight, and insight, about a dynamic marketplace, so there’s always a certain amount of potential change. And that’s OK.
One of the things I like most about the GPS function on my smartphone is that it can update the best route based on current conditions. Why would I stubbornly want to steer my way into a traffic jam when there’s a better route? That’s why we have to hold the reins loosely and let our customers – and market conditions – move the needle as we evolve forward. This is not the same as chasing each new shiny object – that’s just indecision and instability. But it does mean having a healthy mix of situational awareness and opportunistic thinking – a readiness to ask questions and the courage to morph a bit when it seems wise to do so. Particularly for boutique businesses and consultancies, which can adjust direction much faster than large companies, this discipline of listening and reacting to the marketplace can be the key to finding unanticipated opportunities. And perhaps discarding what seemed like a good idea for one that is actually much better. Someone who’s made a practice of this (in the social media world) is Chris Brogan. He has continually evolved over the last decade, refining and re-focusing his business model until it’s reached its current (pretty steady) state. Marcus Sheridan is another opportunistic (and hard-working) evolver. There are many others. I’m all for achieving strategic clarity. But clarity is also an evolving thing. At times, your business comes into focus on a different timetable than you might like. Sometimes the market says No. Sometimes it says Yes. And sometimes it tells you that, with a little tweak here and adjustment there, we’ve got a bunch of dollars waiting for you – because THIS is the pain we really want you to solve. Hint: it’s usually going to be something adjacentto what you’re already doing. Not some totally new thing. Be 85% sure of where you’re going, by all means. But be sure you leave yourself some room to maneuver as the market speaks back to you! 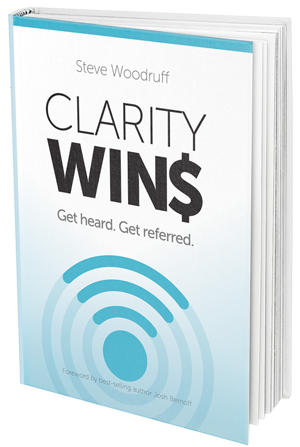 You Can Become the Best Networker in the Room – Right Now. Here’s How.